As you surely must have heard by now Spain’s national team are the champions of Europe. 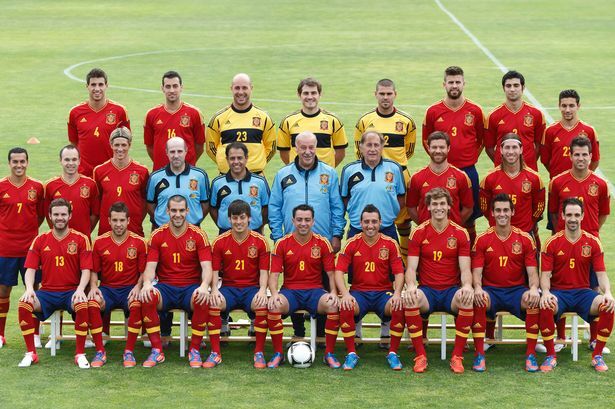 With their 4-0 win on Sunday afternoon La Roja have become the first European side to ever win three consecutive major tournaments (Euro 2008, World Cup 2010, and now Euro 2012) and in doing so have cemented their place as one of the most impressive and dominant teams in soccer history. Under the guidance of head coach Vicente del Bosque, the Spanish side have become known for their unique style of play which involves complicated positional changes with their midfielders and a free-roaming movement with the rest of their players. The Spanish also incorporate more one or two touch passing then most other teams these days, keeping their opponents on their heels and running around the pitch constantly trying to defend the ever-moving Spaniards. If you can appreciate the intricacies in soccer and notice the tactics that team’s employ, then the Spanish mold is one that you should particularly adore, as this squad has their style down to a science. It helps that they also have some of the most technically sound players in the world, so the mix of style and substance blends perfectly creating what has become such a fascinating team to watch. Spain dominated the final match versus Italy from start to finish. They quickly took control in the 14th minute with a header from David Silva and then they never looked back. In the 41st minute they got an insurance goal from Jordi Alba which would set the tone for the remainder of the match. In the second half Italy used their substitutes to try to bring more offense on to the field, and unfortunately for the Azzurri it just wasn’t meant to be. Reserve Thiago Motta, Italy’s third and final substitute, injured his hamstring shortly after entering the game and Italy was forced to play the remainder of the match down a man. It’s hard enough to come back against Spain with 11 men, and nearly impossible to do it with just 10, but Italy kept the game within reach until the final ten minutes anyway. Fernando Torres scored in the 84th minute and then Juan Mata added the tournament’s final goal in the 88th minute, sealing the 4-0 win for Spain and helping them to their second straight European Championship title. Is this Spanish team the best ever? I can’t answer that. I haven’t followed soccer long enough to give a definitive statement on their place in history, but I can tell you that they are now in that discussion. If they win the 2014 World Cup in Brazil they will probably totally end that discussion, and if the United States aren’t able to pull an improbable run like they did in 2002 World Cup (and my boy Wayne Rooney finds himself suspended again during that World Cup) then I probably will root for the Spanish to pull it out again so that I can tell my kids I saw the best team in soccer history. The only thing that I know is that this team is fun to watch, and that they get production from every single player in their starting XI. This team is incredible, and I’m glad that I got to witness their run through Euro 2012. Congratulations, Spain. And as much as I hate to write this, great run Italia. This entry was posted in Soccer and tagged Euro 2012, European Championships, FIFA, Football, Italy, Soccer, Spain, Sports. Bookmark the permalink.